I love this cookbook. I didn't even know it existed until my last sweet potato post. Karen (blogless?) mentioned to me that The Practical Produce Cookbook had a lot of good sweet potato recipes, so of course I had to check it out. All the reviews I read raved about it, so of course I wanted one too. I love this cookbook. It's a gardener's cookbook. Unlike most cookbooks, which are organized according to types of dishes (entrées, desserts, soups, salads, etc. ), it's organized by garden produce: asparagus, beans, beets, broccoli, Brussels sprouts, ..... summer squash, sweet potatoes, turnips & rutabagas, and winter squash. 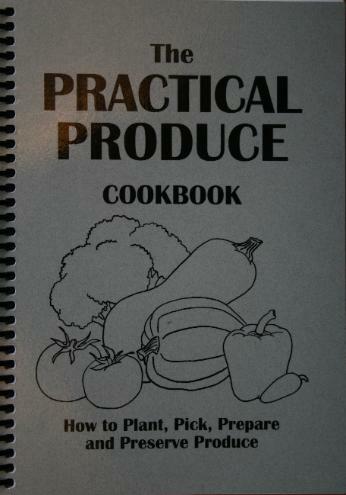 The full title is The Practical Produce Cookbook: How to Plant, Pick, Prepare, and Preserve Produce. With all that information plus recipes, the book is a handy resource. Planting, growing, and harvesting particulars are included for each vegetable, plus lots of recipes and we've liked every one I've tried so far. In addition to vegetables, are a few garden fruits: ground cherries, melons, rhubarb, and strawberries. The last two chapters are vegetable and fruit canning and freezing guides. To see sample pages and recipes, click on this link, which will take you to the publishers website. With a fall garden still full of vegetables, this is already becoming one of the first cookbooks I reach for. It's taking its place of honor right next to my other two trusty favorites, The Joy of Cooking, and the all-American standby, Betty Crocker (1969 edition, now badly stained, coverless, and with the index torn to shreds. It was a gift from my grandmother.) It's funny, because my cooking practices and techniques have changed so drastically, that I no longer actually follow the recipes in those two books to the letter. I substitute many ingredients, like the types of flours, fats, and sweeteners I use. I adjust the amounts. I soak my grains or substitute sourdough starter. I've learned to adapt them to how I cook. Even so, I just like those cookbooks. Nourishing Traditions probably had the most profound impact on how I cook and how we eat. I use it as an information resource, but to be honest, I haven't liked any of the recipes I've tried from it so far. I've just learned to apply the methods to recipes I do like. A few other cookbooks that I grab on occasion are my Better Homes & Gardens New Cookbook (not so new anymore however), More-with-Less Cookbook (how to reduce food costs and resources by simplifying meals), The Amish Cookbook (purchased at Shady Maple Restaurant Gift Shop on our trip to Pennsylvania last year. It was the canning recipes that interested me, particularly for bologna.) Also Cooking With Wisdom , and a church fundraiser cookbook called Cooking With Love. All of these have recipes I like. I have a few specialized cookbooks, such as Preserving Food Without Freezing or Canning, Wild Fermentation, and The Red Star Centennial Bread Sampler. 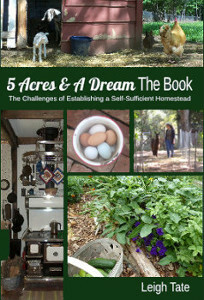 Then of course there are recipes in books like Animal, Vegetable, Miracle, Small-Scale Grain Raising, or recently purchased How to Store Your Garden Produce. Unless I know of a specific recipe in one of these however, they aren't the kinds of books I go recipe hunting in. That about covers my cookbook collection. What about you? What cookbooks do you like? Which ones do you reach for when you need an idea or some inspiration? You can either tell me in the comments or blog about it, come back, and leave a link for us cookbook collectors. I'm always interested in a good recommendation. Thanks for the list of books - always good when someone recommends something. I'm going to have to check out the produce book. I have way too many cookbooks to list, I have a book problem and cookbooks are no exception. two books on pasta sauces. Dani, a big yes for both books. And it's the perfect time of year too, with Christmas and holidays around the corner! Heather, fellow bibliophiles, eh? I have the same problem but have had to weed out so many books in our three cross country moves. These have stayed the course. The produce book really is a keeper though. Theresa, thanks for that! My grandmother loved Julia Childs and used to faithfully watch her cooking show in TV. I never saw her with that cookbook though. I need to get some Italian cookbooks. Dan is Italian (half actually, but the Scotch half doesn't seem to count). Also need to try more Indian cuisine. I appreciate the recommendations. Spiderjohn, they are two separate books. The Amish Cookbook was compiled by Alvin and Sallie Lapp and published in East Earl, PA. I should have included that in my post, because I couldn't find any online information about it. I just saw it at Shady Maple and bought it. It has over 1000 recipes, so it's a big one. More-With-Less is a Mennonite cookbook, readily available and loaded with lots more good information that just recipes. And for anyone interested, Cooking With Wisdom is also Amish, while The Practical Produce Cookbook was written and published by Old Order Mennonites. 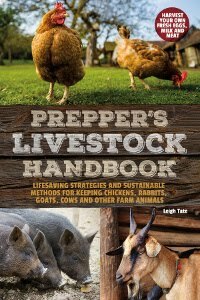 UPDATE: I found The Amish Cookbook online! Will edit this post with the link. The one I use the most is The Joy of Cooking, 1972 edition. Like you, I modify the recipes sometimes, but there is a recipe for absolutely EVERYTHING in there so it's always the first book I check. I also have a newer (1990s) edition of the BH&G cookbook, which has a lot of good general recipes. I always modify these to add more fat because the 1990s was the height of the low-fat craze. Some of my favourite really old books, which I do use on occasion, is a 1906 edition of Fanny Farmer (picked this up at a used book store!) and a 1934 edition of Mrs. Beeton's Everyday Cookery. I love those old books for the domestic advice they give as much as for the recipes. Sometimes it's useful, and sometimes it's downright funny. I might have to make a cookbook post of my own, thanks for the idea. And thank you for listing all your books--I think I'm going to head on over to Amazon and see what I can add to my Christmas wish list! I have 3 go to cook books but a lot of the time I search the internet. My go tos are Better Homes and Garden's, a Texas cookbook and one from the Cheyenne Frontier Days. The last one is very good for pot luck dinners as the recipes are for large groups. The TX one will surprise you with some really great recipes...It has my pecan pie and beef brisket in it. I usually download whatever recipes I want to try. I keep them in a binder if they were good, if not they go to the circular file. I always add or delete stuff from most recipes and I invent stuff, it's not always great but at least I try things out. We have only a dozen or so but the one we always go to is "Joy" -- an 80s edition. Also fond of the older version of Carla Emery's compendium, which was titled "Old Fashioned Recipe Book." I also sometimes try to replicate Little House recipes, using the "Laura Ingalls Wilder Cookbook." I'll have to admit that I don't like my early edition Joy of cooking all that much since the fat content of many of the dishes is so very high. I tossed it years ago. Currently my cookbook collection consists of a variety of Thai and Indian recipe books and some of Jamie Olivers stuff which is fun to read but has some rather interesting and incredibly strong flavour combos. (It was a gift) The rest are still packed and I've no idea where. Food that Really Schmecks(Mennonite cooking) was one I used a lot when my kids were young. I also have a whole slew of Medieval Cookery books, both facsimile types and those with modern redactions. That's a whole other cooking ballgame. Laura, yes, please do write a cookbook post! I would love to know what cookbooks others use. I was delighted that you mentioned Mrs. Beeton's. I've heard of that one and think it would be a good collection to my own cookbook library. The other think I love about Joy is the "About" sections. I've learned so much about food from them. And as you say, there's a recipe for almost everything in it. Bety, that's a good idea. About saving downloaded recipes and also about experimenting. I tend to lose the ones I like from the internet. And I have a few flops along the way with my experiments as well! Risa, I forgot that Carla Emery's book includes recipes. I need to go take a fresh look! I love her book as a resource. It's always the first thing we grab when we're researching a new venture. Nina, I think it would be fun to study medieval cooking. You've blogged about some of those recipes, haven't you? It's the techniques that fascinate me, since they had to do all their cooking and preserving without electricity and modern canning equipment. Probably a lot of lost knowledge there. Some people are hunting down old "Joys" because they have information on butchering and game and such that disappeared from later ones. We met Carla in the 70s. The first edition was mimeograph, and the ladies of Kendrick, ID would collate it by walking around a big table in an old storefront downtown. We followed her around the table for about an hour and earned our first copy of the book that way. A treasured memory. Risa, I had no idea about the difference in editions of Joy. Of course I immediately had to go check mine out! Happily, it has the entire section on game, with really good details on butchering and dressing out. What a great way to get a copy of The Encyclopedia of Country Living! A treasured memory indeed. Risa - Do you know what happened to Carla Emery? I mean where she lives now and what she's doing? I have one of her first edition mimeographed copies that you probably helped put together! Leigh, I just went and did a quick count of my cookbooks . . . I have over a hundred right in my kitchen! Should I be ashamed or proud? Guess I could do a blog about that abundance and tell how many I regularly use. I also have a big box of cookbooks packed away of my mom's that I took when we cleared out her apartment after her death. I know there are some treasures there and I'm determined to go through the box this winter. Oh, I'm a Better Homes and Gardens fan. I have my mother's copy since the one I bought later eliminated salt - boo. I love Joy of Cooking and Laurel's Kitchen, also an oddball, the Los Angles Times California Cookbook. I've had my copy since my children were babies, i.e., looong time ago. Jain, thank you for your kind words! Mama Pea, Risa may have more details, but sadly, Carla Emery passed away in 2005. Yes, I do think you should blog about your most used cookbooks. And maybe some other favorites. And tell us why! Sharon, later editions of BHG eliminated salt? That would be a boo from me too. Funny how we all like some of the widely published standbys, but also have a few uncommon, locally published cookbooks as well. Well I know I'm the oddman out here but my favorite is the purple folder filled with local restaurant coupons. no kidding, as former server of 13 years i love to be served. However, the times I do have to cook 13 out of 14 nights, I use my original Betty Crocker paperback sized cookbook. which is falling apart because it is from Sept 29, 1979. Some day i hope to have the pink edition to support breast cancer and retire this one to the retirement condo where it should hold up really well until we retire. Date unknown. i love reading of all the lives that are so unlike my own. enjoy your blessings, whichever type of urban/non-urban world you live in. Denise, that's pretty honest, LOL. True, not everyone likes to cook. Those Betty Crocker pink editions will be collectors items someday. I'm sure there are differences in the editions. It seems like mostly, we like what we're used to. Well, I love reading your blog Leigh and I love to talk (dh just last night was comparing me to Sniffles, some chatty cartoon mouse? )but I'm not a very good cook at all. After reading your tilling post I thought well I coullllld do a small area as a raised bed and put a different crop in each year. but then i remembered all the times i've asked dh to invest in a garden and all the failures I've had due to the heat. My latest thought is to have all my garden in large planting pots and maybe i can survive the heat better that way here in the Tampa area of Florida. I just lost a rosemary plant (yup only one) that I have had since spring of 2007. Now that is a record for me. Denise, I appreciate that! I would absolutely encourage you to give gardening another go. Heat is definitely a challenge to the gardener. I lived in central Florida for about 6 months, long enough to have a fall garden. I'm not sure how a summer garden would have done, but with the mild Florida winter, our fall garden did great. I had the best broccoli, carrots, and radishes I've ever had. Maybe you should consider reverse seasonal gardening. Take a gardening break in mid-summer, and focus on fall, winter, and spring. With a hoop house to protect during the occasional cold snaps, you could probably grow and harvest quite a bit. The Betty Crocker cookbook that I got as a wedding gift, which, like yours, has lots of food stains on it. The second one is the South Beach Diet Cookbook - lots of great food in there! But, mostly I tend to be a seat-of-the-pants type of cooker. I know what we like, and try different ways of putting ingredients together to come up with new variations. Most work, some fail, but it's never boring. Oh, that cookbook has me intrigued. It sounds so brilliant for a gardener.